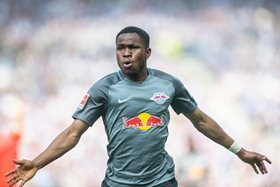 In what should be his final game for RB Leipzig, England U20 World Cup-winning winger Ademola Lookman was on target as they cruised to a 6-2 win over Hertha BSC at the Olympiastadion Berlin (Berlin) on Saturday afternoon. The Everton loanee was named in the starting line-up while Jordan Torunarigha returned to the Hertha Berlin team after serving a one-game ban for accumulated bookings. Upamecano opened the scoring for the visitors on 2 minutes, Ibišević restored parity two minutes later before Lookman got in on the act to make it 2-1. Augustin struck in the 22nd minute to extend the lead with Lookman providing the assist for the goal. In the second half, Lookman would garner his second assist of the afternoon after setting up Augustin again in the 54th minute, before he was replaced in the 62nd minute. The Nigeria Football Federation target has made a big impact for RB Leipzig since joining them on loan in the January transfer window and was named the most outstanding player in the Bundesliga for match day 33 after scoring a brace against Wolfsburg. Lookman was directly involved in nine goals ( 5 goals and 4 assists) in 11 Bundesliga appearances.